On the second day of April in 1817, the first official settlers – Hanmer Palmer and Eber Mallery, along with their families – came to live in Westfield township. That same year, Joseph S. Winston and his wife settled; purchasing the land on which the town of Friendsville would stand. In fact, the settlement was originally called Winston’s Corners. In the years immediately following, there came others among which were Warren Brainard, James Chapman, Ansel Chapman, Alvah Beach, Rufus Vaughn, Shubal Gridley, Peter Crush, Isaiah Briggs, Jonathan Simmons, Isaiah Simmons, Deliverance Eastman, John Ross, Miles Norton, and John Hosford; most with their wives and families. Soon after, on September 10, 1821, there came the death of Fanny Beach, wife of Alvah. Her death and burial is recorded as the first in Westfield township and so began the story of this old cemetery on the hill. Burials in the old section were fairly constant throughout the 1800’s but tapered off substantially at the turn of the century. After 1900 only about thirty more burials are known to have been made there; with the last one being that of Catharine Bauer in 1946. Most of those burials were on already-established family lots. The land down in front of the old cemetery was an easy choice for expansion. The new section was formally deeded to the township in 1898 although two dates older than that can be found on headstones there. The infant Robert G. Woods (1869) had to have been buried elsewhere – possibly up on the hill. His name is engraved on a more modern headstone with his parents. The other is Lucretia Olin (1895). After 1900, many lots in the new section were purchased and most new burials were made in this area of the cemetery. The area between the creek and the hill wasn’t used for burials until the 1970’s. In 1989, the township trustees acquired another acre of land in the rear of the cemetery but that area is currently undeveloped and not platted for use. When that first grave was dug on the hill in 1821, the northern part of the cemetery property was part of a fifty acre parcel owned by Henry Thorndyke. This parcel was combined with another fifty acre parcel purchased from James M. Eastman. Now a one hundred acre parcel, it was purchased by Ansel Brainard from Henry Thorndyke on October 2, 1827 (Volume 5, page 56). This same parcel was then sold by Ansel Brainard to Alvah Brainard on July 1, 1833 (Volume 5, page 57). The above exemption only represents the northern portion of the old cemetery on the hill. Where the southern part of the old cemetery became excluded from the land transfers is not clear. It seems that it was part of another parcel which was owned by James Chapman at the time when the cemetery was started. Chapman had purchased the fifty acre parcel from Henry & Israel Thorndyke on March 4, 1819 (Volume C, page 259). This parcel was sold by James Chapman to David Sausman on January 27, 1831 (Volume E, page 375). On the same date, Sausman also acquired 30 adjoining acres from William Case (Volume E, page 376). Now the cemetery land in question would have been part of a parcel measuring about eighty acres total. These three exceptions to the transfer account for the loss of the two acres from the overall parcel. Given the above mention of the `strip’ – and nothing else about the cemetery – presumably the entire portion of the old cemetery on the hill had by then been exempted and under the care of the trustees of Westfield township. The newer section of the cemetery was originally part of two different parcels. The north part was 5/8 of an acre and a piece of Alvah Brainard’s one hundred acre parcel mentioned above. Brainard sold this small piece of land – bordered on the north by the cemetery driveway – to Emmons Blakeslee on December 11, 1840 (Volume U, page 364). The south part was ¾ of an acre and was purchased by Blakeslee from David Sausman on December 11, 1840 (Volume U, page 365). Now a single piece of land measuring one and three-eighths acres in size, it was sold by Emmons Blakeslee to Daniel Blakeslee on January 13, 1844 (Volume V, page 491). and then by John F. & Mary S. Rich to Henry Earl on December 23, 1851 (Volume 5, page 431). The old section of the cemetery was never formally deeded to the township although the trustees did assume responsibility for its upkeep at some point. “ …Being a part of Lot No. 10 and is bounded as follows: beginning at the south west corner of the public cemetery, thence west to the center of the highway, thence north along the center of the highway to a point from which a line drawn east to the northwest corner of said cemetery shall be parallel with the south boundary line, thence south from the north west corner of said cemetery, containing one and three four (1 ¾) acres more or less. The strip of land in the back of the cemetery had long been included within its borders but, apparently, had not been formally transferred. This piece of land essentially consisted of the driveway as it rounds the back of the cemetery. The vault is not mentioned in the sale of the property just two years prior; perhaps an indicator that it was built during that period – around 1850. The piece of land for this vault was a perfect square of 49.5 feet on each side. The building’s primary purpose would have been for storage of the deceased; primarily during times when the ground was frozen. Given that neither the dimensions of the newer cemetery parcel nor those of the old cemetery on the hill were ever really defined in any deed record, it is not clear exactly where the vault once stood. 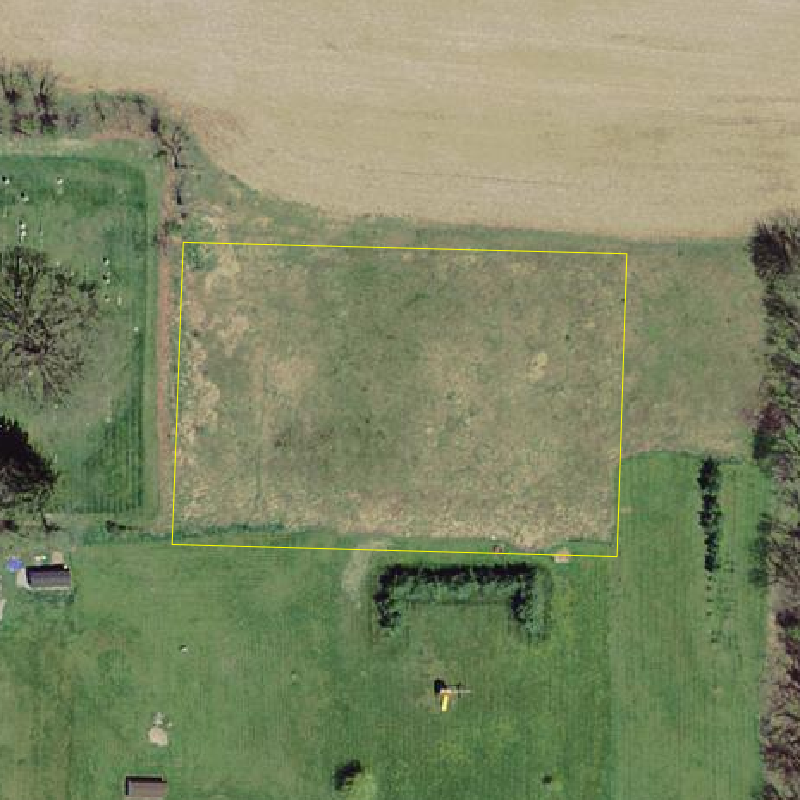 It is described as being in the northeast corner of the newer parcel but, since we don’t know what was considered the northwest corner of the old cemetery, it could be one of two places. If the beginning of the actual rows of graves was used, the vault would have likely been around where the grave for Nicholas Antonio Exposito now is (Lot 186 (red dot)). 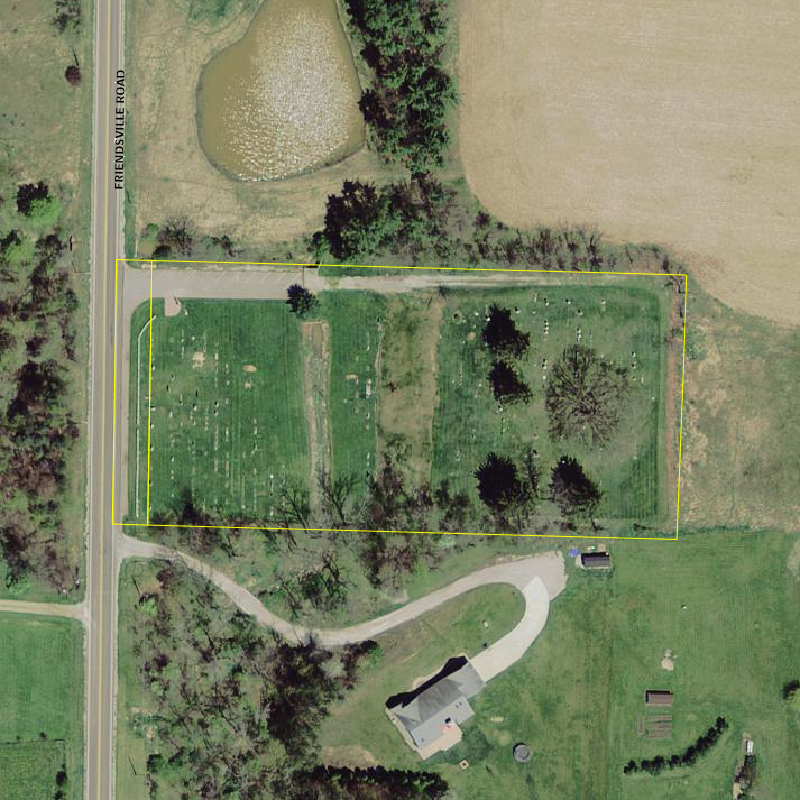 The overhead photo below shows how the driveway, which otherwise runs fairly straight around the perimeter of the cemetery, makes a slight curve in this area. There were no graves there at the time so it certainly could have been there. The other possible site is just down the hill between the creek and the old driveway (green dot). That area has since been laid out for burials but was unused at the time. Either way, the vault has been gone for some time as it is not shown on the WPA map which was done before 1940. The driveway enters from the road and used to go around the perimeter of the old section in the shape of a letter `P’. Over time, and with the ceasing of burials in the older section, the loop of the driveway was abandoned. In 2010, the wooded hill between the old and newer sections was graded. In that process, the section of driveway on the west side (front) of the old section was eliminated. The original cemetery records for Friendsville cemetery were lost many years ago in a fire. The records that remain have been reconstructed by township officials from talking with relatives of the deceased, elderly locals, former trustees, and what can be determined on site. In 1991 then-trustee Sherrod Duecker compiled the current cemetery records held by the township. These records are fairly well-detailed with regards to the lower two sections but contain no information about the older section on the hill except for what is on the headstones. Sherrod Duecker’s report mentions that the older section did have numbered lots as well at one time but there are no numbered lot markers to be found. The lot for the Ish family (in Row 7) is the only one that has any lot markers and those have only the letter `I’. If we use those lot markers to establish the boundaries, that particular lot measures approximately 14 feet by 7 feet and is known to have three burials. Over the years, as tombstones fell over or were vandalized, many of these were piled up. When the stones were reset, some weren’t put back in their original location. This is especially true for footstones. Others are known to have disappeared. Because of this, the records for this section are sketchy with regards to rows and burial locations. Duecker’s report also indicates that the new cemetery was surveyed and platted by D.D. Leyda in 1925 and that those lots already claimed or occupied by burials were `homesteaded’. The WPA did a survey of this cemetery which reveals a number of details. The older section on the hill is drawn up by individual graves and not lots. This confirms that records of layout and lot numbering for that section were already gone. The WPA did show eighteen rows of graves which matches what one sees onsite. It also shows at least two lanes that run through the section. It does not accurately portray the old driveway where it bends slightly to the west around what is now Lot 186. The lower sections were mostly drawn up by lots although those that had already been `homesteaded’ – and apparently without records as well – were drawn up as individual graves. The WPA map does not mention the current lot numbering system used by the township. Instead, the WPA simply lettered the rows in both the old (A-R) and new (A-P) sections. For our listings we have elected to number those rows. The WPA map shows the front fence – which has long since been replaced – much closer to the road. Now there is a parking area in front so the current fence is right in front of the first row of headstones. The driveway leading from the road up to the hill has also been widened substantially since that map was done. In 2010 a flagpole was erected. The maps in this guide have been altered to reflect these and other changes. The current cemetery records for the newer sections are thorough, with the exception of the homesteaded lots for which there is limited information. This is especially true with respect to individual grave location and lot sizes. Lots in the newer section measure 10 feet long by 12 feet wide; being setup for four gravesites. Gravesites are lettered A through D starting with the northern-most grave. Those lots that were `homesteaded’ do not necessarily follow this guideline. In fact, the WPA map shows these homesteaded lots with only three gravesites each. The accuracy of that is dubious. Each row is made up of sixteen lots with a ten foot walkway running east-west through the middle of the section. Oddly, the walk isn’t in the exact middle; with there being seven lots, then the walkway, followed by nine more lots. There are also walkways running north-south between the rows at various intervals. Numbering of the lots was generally done from north to south; starting with number 1 in the western-most row. Upon reaching the end of the row, numbering restarts at the north end of the next row to the east. There are exceptions to be found (see map). The lots that were `homesteaded’ prior to the numbering of this section were left out of the system mentioned. Instead, these lots were skipped over during the numbering and filled in later. Starting with the first row, these lots were numbered in the same direction but with a letter `a’ before the number – beginning with a1. The section between the creek and the hill was numbered in the same way although there are no walkways between the lots. Also, when the lots were numbered, the numbering stopped in the last row with #185 due to the encroaching hill. The grave of Nicholas Antonio Exposito, actually up in the northwest corner of the old section, is a single grave lot numbered Lot 186. There are no lots numbered 187 thru 199. Later on, at the south end of each row (excluding the fourth row) three more lots were added. Two are normal-sized lots while the third is a single-grave lot. These lots were numbered in the same manner as the rest of the new section, but starting with 200 and ending with 208. The first lot in each row of the new section (west of the creek) no longer exists due to the expanded driveway. No burials were ever made in that area. In addition, the second lot in each of those rows is no longer available for use or sale given its proximity to the drive. The first two lots of the four rows east of the creek have also been closed for use or sale. Township cemetery records viewed were current through December of 2010. On June 16, 1989, the Board of Trustees of Westfield Township acquired one acre of land from Margaret B. Hawley (Volume 496, page 765). This acre of land is directly behind the old section on the hill and will eventually be used for burials.